Fight for Space – Keep Swinging! The Fight for Space Kickstarter campaign is still underway, and are at around $56K of $80K needed. Go Go GO! For the sake of decency, I will not present the graphic reality of their final trip outbound. It is sufficient to say that they dared greatly, and paid a price, as did their family, friends, and a nation. Even the world felt the sting of that dark day in the clear blue sky. Still, we continued on, and we will continue to do so. 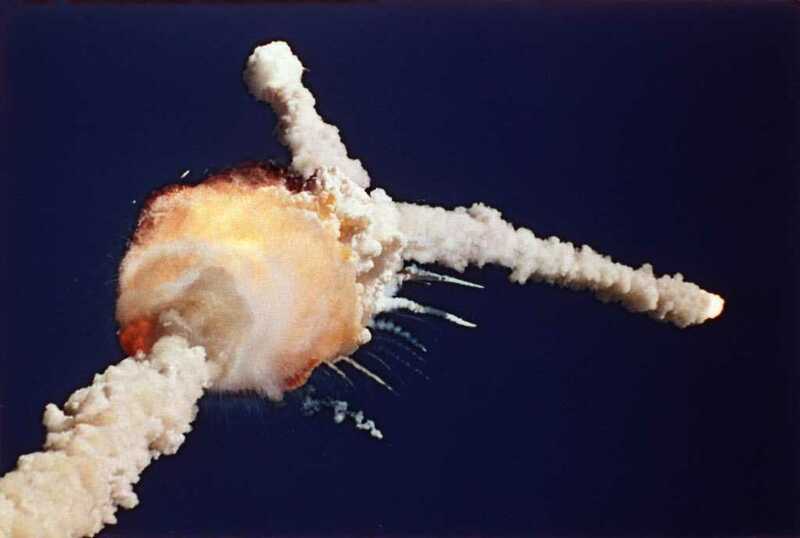 I thank the crew of Challenger for risking themselves and honor their sacrifice by doing my best to make sure that it wasn’t in vain. At NASA’s Johnson Space Center (JSC), there was held a press conference with SpaceX, Boeing, and their mutual customer, discussing the status of the Commercial Crew program. To put it shortly, both companies plan on being able to fly crew to ISS in 2017. This is great progress! As I also monitor terrestrial events while I keep watch on the stars, a great worry for me is our rapid slide back to Cold War with Russia. In that light, Bolden’s comment is very telling from a diplomatic point-of-view. Russia recently re-nationalized their space industry, so to say that we no longer want to coordinate with Roscosmos is virtually the same as saying that we wish to stop engaging Russia’s space program. That is really bigger news than even sending commercial crews to the space station we share with them, though it may not receive nearly so much press. Fight For Space – Keep Fighting! The Fight For Space Kickstarter campaign is at just under $25K right now, with ten days to go to get $80K. I will be highlighting this everywhere I can, and I encourage others to do the same. The kickstarter for Fight For Space is continuing to collect pledges, but it could be faster. Please consider helping them out, and tell your fellow space nuts! Dennis Wingo has written a very impressive article on the effect of the Apollo program on the whole of the national space program until the present day. In a way, it provided me a sort of epiphany on why we have such a difficult time finding and executing a focus. Really, I have not before seen so well-stated an explanation of the situation. I won’t bloviate endlessly on what Mr. Wingo had to say, other than to summarize what I got out of his missive. What was sold to the American public was a space program that included all of our flying-car desires and plans for the future like moon bases, asteroid mining, and trips to mars before the end of the century. This Public Space Program was very different from the creature known as the Political Space Program, which had the more earthly goal of beating the USSR in the very ideologically crucial arena of technology. Capitalism must beat Communism, it must show that the free market provides the flexibility to excel, and that our society was better. In many ways it did just that. Of course, that ideological victory drove Apollo and then later programs to be even more politicized, and so many of our national space goals became just checkboxes on a list. Sometimes the checkboxes linked to another one on the list, and sometimes they were dead-ends. Paths across a frontier aren’t often plotted very straight that way. The ultimate goal is not to impress others, or merely to explore our planetary system, but to use accessible space for the benefit of humankind. It is a goal that is not confined to a decade or a century. Nor is it confined to a single nearby destination, or to a fleeting dash to plant a flag. The idea is to begin preparing now for a future in which the material trapped in the Sun’s vicinity is available for incorporation into our way of life. I agree with Wingo that the above is about as articulate a description of an American Space Program as you could imagine. On the other hand, while this American Space Program is at odds with the Political Space Program, I do not agree that the Political Space Program is a failure. Rather, I see the Political program having just about reached the limits of its capability, and it does tend to wander. In those many decades of wandering, it has stumbled into a number of interesting areas, leaving a good bit of science and technology all over the place. For those of us whole entered the Space field because of the promises of the Public Space Program, it is up to us to pick up all of the best bits and move forward on a straighter path. Apparently, for the descent trip back after stage separation, they use an open-loop hydraulic system to control a set of the steering vanes. In this case, open-loop means that they use the kerosene from the fuel as a hydraulic medium for actuating the vanes. SpaceX said that they didn’t carry enough margin to control the system, leading to the crash. Initially, I bought that explanation. Now that I’ve had a few days to let the thoughts marinate, what bothers me is that if the kerosene ran out to control the vanes, why was the engine still at thrust during the crash? Also, at the then-low descent speed, what would the vanes have to do with touchdown? I’m thinking some other factor or set of factors caused the crash. It is much less embarrassing to say that the crash is the result of a technical problem that you can throw engineers at than to admit that an assumption of good weather and calm seas are a given at landing time. If it were the latter, it was a failure of basic planning, and they can fix that either by being more circumspect on good landing conditions on the ocean, or pressing hard to get land landing approved by the FAA. What could be even worse to admit is that the actual landing control authority you thought you had wasn’t really there. In other words, a basic level of advertised capability didn’t pan out. That would be much harder to recover from as a program. Don’t get me wrong, I really don’t buy into the SpaceX vs Orion competition meme. I wish Elon Musk and his team all the luck in the world. Really and truly, the outbound expansion into the solar system and beyond isn’t going to be the purview of government forever, it just can’t be. Accordingly, the desire to have a successful fly-back booster is a good economic one, and government never equals good ROI. As fuel is relatively cheap compared to hardware*, and if the hardware can be truly refueled and reused, then it makes sense for SpaceX to try to soft land their first stage. I can certainly understand the motivation. *If they want to loft more mass to orbit, then it becomes a surcharge to the customer to pay for the booster. Otherwise, you just limit the mass of useful payload to allow for the landing fuel margin. That is, you use the booster in a non-flyback mode to trade fuel mass for useful payload mass. For any given flight, then, SpaceX has to assume some risk that they lose a booster, but under nominal flights the booster is already paid for, or the customer pays a premium to replace it. For a lot of people, me included, there is a fascination with moving out into space using space stations of various configurations. I have a good number of years under my belt with the International Space Station (ISS) program, but I have always been drawn to larger systems of the future, like the rotating station-wheel of 2001, or the rotating cylinder type, like the Babylon 5 station or the enigmatic ship from the Rama novels. Really, I have always gravitated (no pun intended) to the latter of those two, more generally known as an O’Neill Cylinder. I find the O’Neill cylinders to be the most straight-forward way to build a rotating station, as the cylinder is such a simple geometric volume, and offers the greatest advantage of available habitation square-footage on its interior. No space-based structure is simple to implement at this time in our technological development, and there would be many logistical hurdles we’d have to clear to make it happen. Fortunately, the namesake scientist Gerard K. O’Neill, devised a clear roadmap to start such a development. His book, The High Frontier, originally published in 1976, still holds up really well in light of our somewhat stagnant space exploration progress over the past few decades. For many in the space industry it is a staple in their personal libraries. O’Neill’s work in the entire area, including his station designs developed for the Space Studies Institute, is inspiring to so many. Pressing forward, these designs need to be brought up again and again, and we should strive for them to become reality. There is in production what looks to be an interesting independent film dealing with the fate and future of the American space program. From what I can see on the Fight for Space Kickstarter page, I’m not entirely sure if it is leaning towards the government model, the private sector model, or the for-God’s-sake-do-something model, it looks like a deeply researched effort, and the filmmakers have interviewed a lot of luminaries in the space field. Unfortunately, it seems that their original Kickstarter funding has run dry, and they are starting another round. They are looking for an additional $80K to complete the production, and they are a shade over a tenth of the way there, with 16 days to go. I wouldn’t presume to tell anyone else to do, but I’m interested enough to kick in some cash at the $50 level, and get a blu-ray of the film. At the rate they’re gaining pledges, they might just make it. STEM is part of an initiative the Boy Scouts of America has taken on to encourage the natural curiosity of youth members and their sense of wonder about these fields through existing programs. From archery to welding, Scouts can’t help but enjoy the wide range of STEM-related activities. To support this initiative, the BSA developed the Nova Awards program so that youth members have fun and receive recognition for their efforts. We live in a time of great opportunity. The spirit of innovation can help us overcome challenges and ensure a prosperous and secure future. To seize this opportunity, we must position ourselves at the cutting edge of scientific discovery and technological innovation. Yet our country is falling behind in science, technology, engineering and mathematics. This is why many professionals and educators in science, technology, engineering, and mathematics believe the United States should do more now than ever to encourage students to enter STEM-related fields. These experts say our young people need strong STEM skills to compete in the world market. We must work together to cultivate the next generation of critical thinkers and innovators. The Outbound mission is to increase space exploration and exploitation as a means to normal, even vital, human and societal development. To have a long-term and respected organization such as the scouting program directly target young minds with the idea that STEM is an exciting and worthwhile endeavor, I find that wonderful. What I also notice is that the names of the awards and a lot of the iconography in the BSA STEM literature links back to space and space exploration. For a great deal of the world, and obviously for the planners of this education initiative, STEM success is so often tied back to space. In a way, I think it is very telling, in regards to the instinct for human advancement. Space is where the action is. And humanity knows it. See the STEM/Nova homepage for more information. There is life in Outer Space - We're It!